This long form class will be held with the intention to deepen and inspire your practice. Bringing balance though a yin yang style offers a reflection into the difference of action and stillness and how they work together. Asking what effect that balancing quality has, as it engages the mind, body & spirit. Finding a deeper openness and flexibility. The timing feels good as well. Think spring cleaning. Finding a balance in seasonal transitions. Yang = action, activity, effort. We will heat up for the first hour, igniting your inner fire. 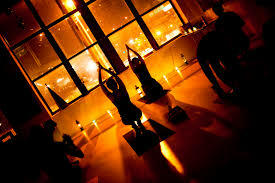 We will practice a strong vinyasa style, in a personal intentional way. As the sun sets we will move into deep holds and long stretches, cultivating a receptive quality in our bodies. Explore the relationship to your yoga practice with deep breathing, and long melting holds, subtle movement, and stillness. Being nurtured and balenced in the embrace of a candle lit studio environment. Some light aroma therapy may be used, so please rsvp if this is an issue. Register here. Cost $20 member. Non member pre register $25. $35 drop in rate.